Keep Your Garden Green, Make Your Water Feature Clean! Gardeners dream of having lush, green lawns and full, green plants. But it takes time and dedication to create an emerald landscape to be proud of. The one thing you don’t want to be green in your garden is a water feature. Water features can either be installed as a centre piece in a garden or as a subtle ornament that provides tranquil sounds and a place for birds to bathe. Either way, they shouldn’t be covered in green water and algae, so it’s time to use a water feature cleaner. Water Feature Klear uses beneficial bacteria to target the algae found in water features and eliminate it naturally. 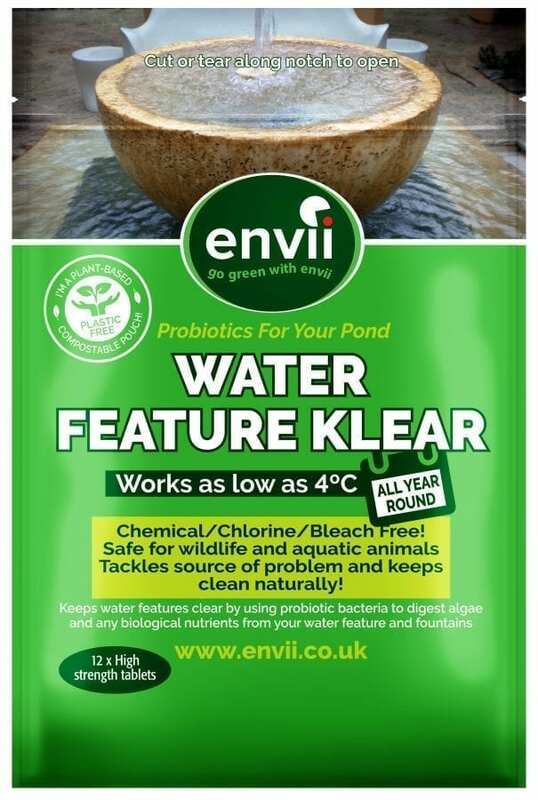 Using the same innovative bacteria that’s used in the well-known and trusted Pond Klear, this water feature cleaner can still work efficiently below 4C to digest algae and green water. This level of performance gives you the reassurance that your water feature will remain clear throughout the year. 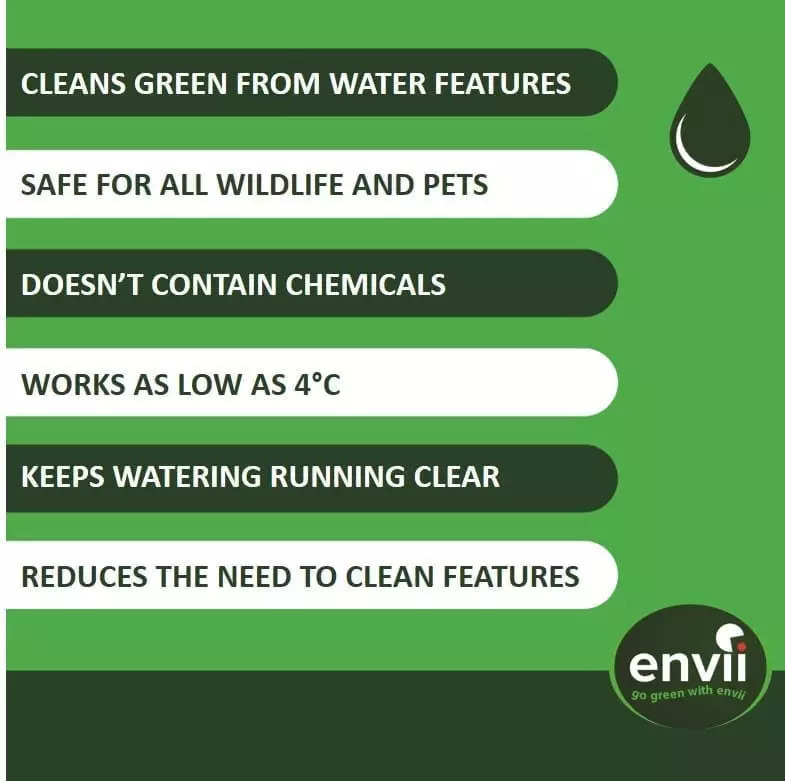 Unlike other water feature cleaners, Water Feature Klear contains no harsh chemicals making it safe for all wildlife. As it is 100% natural, you could say, it’s a green machine that’ll keep your water feature clean. As we’re using nature rather than chemicals, the cleaning process can take several weeks but will last a lifetime! If you have recently used bleach on your water feature, make sure you clean it thoroughly to remove any chemicals. For best results, keep the water running in order to circulate the bacteria and maintain oxygen levels in the water. Clean water feature with warm soapy water to avoid killing any beneficial bacteria or adding harmful chemicals to the water. Is this safe for birds who drink from the water feature? 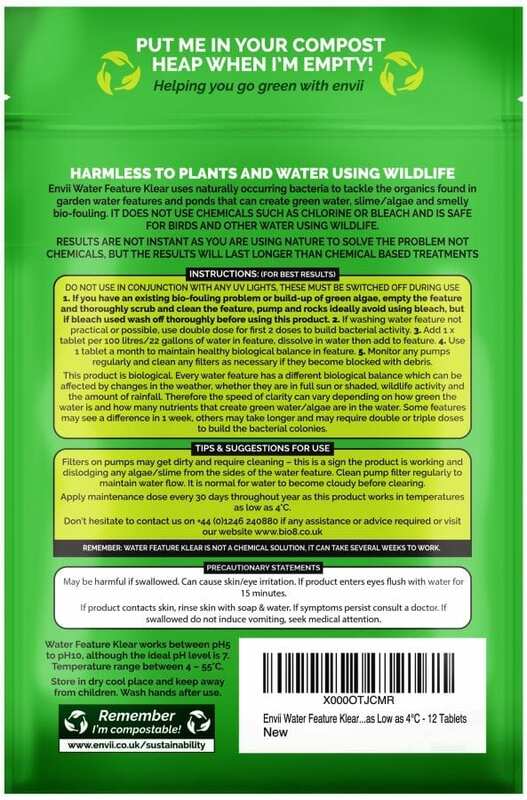 Yes, It is a natural product that poses no danger to wildlife, pets or children. It won't target algae directly but will slowly starve it to death. Can it be used in all water features? Yes, Water Feature Klear is safe to use on all surfaces.